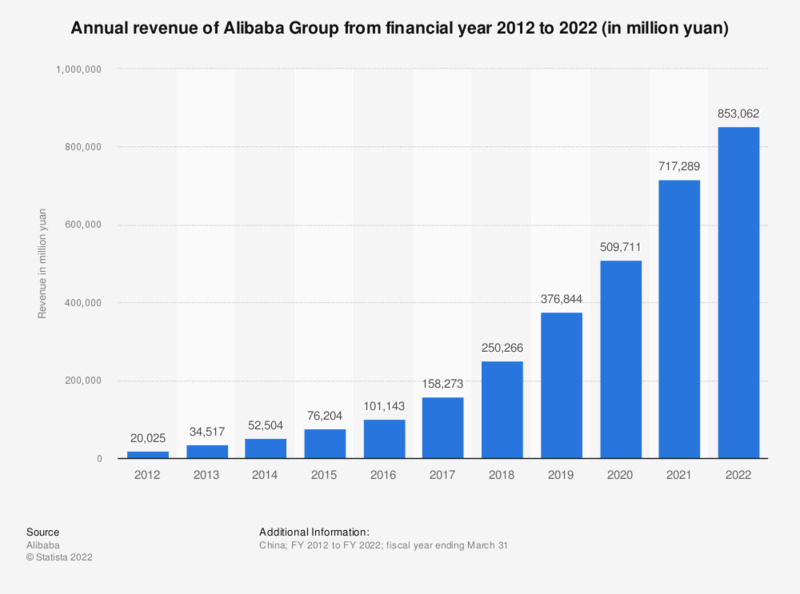 The statistic shows the annual revenue of the Alibaba Group from 2010 to 2018. In the fiscal year ending March 31, 2018, Chinese e-commerce corporation Alibaba recorded consolidated revenues of 250.3 billion yuan. This translates to approximately 39.9 billion U.S. dollars. Alibaba was originally founded in 1999 as a B2B e-commerce portal to connect Chinese manufacturers with overseas buyers. In 2003, the service expanded to include Taobao, a C2C e-commerce marketplace and in 2008 Tmall, a B2C online commerce platform focused on brands and online retail. To round off the digital offerings, group shopping and flash sale website Jujuasuan was launched in 2010. Overall, the largest portion of Alibaba Group revenues were generated through Chinese-based e-commerce as company data states 13 billion U.S. dollar segment revenue in 2016. International commerce only accounted for 1.2 billion U.S. dollars of annual revenues, followed by cloud computing and internet infrastructure services. That year, retail e-commerce in China accounted for 79 percent of company revenue. Alibaba Group’s net income amounted to 11.06 billion U.S. dollars. The group’s monetization model relies heavily on online marketing services including P2P marketing services, display marketing and promoted selling as well as commissions on transactions and storefront fees. Alibaba’s Chinese retail marketplaces had more than 443 million annual active buyers. According to company data, mobile accounted for 75 percent of gross merchandise volume. Alibaba also holds stakes in online video company Youku Tudou and entertainment company Alibaba Pictures. Data is on GAAP basis. The fiscal year of Alibaba Group ends on March 31 of each year.